Struggling to keep up with search algorithm updates, SERP features, and evolving ad formats and platforms? It can be overwhelming. We have the solution. 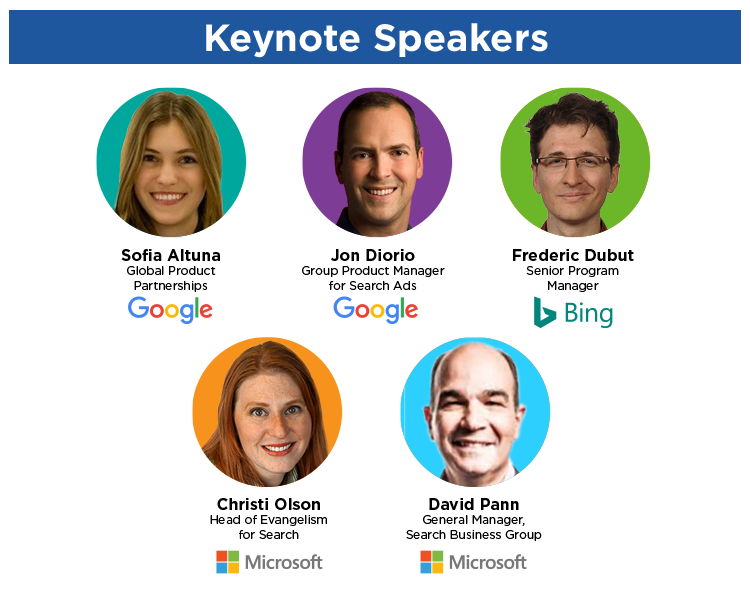 Get first-hand advice from Google and Bing at SMX® East, October 24-25 in NYC. Sofia, Jon, Frederic, Christi, and David are ready to share actionable tactics and insights on how to build winning content and campaigns. And the keynotes are just a part of what’s happening at SMX East. Check out all of the sessions, presentations, clinics, networking, and workshops. See the complete agenda. Psst… Need another great reason to attend? We added EIGHT clinics to the agenda! Bring your burning questions to a panel of experts ready with answers and advice on SEO, SEM, Link Building, Social Media, Content, Analytics, Conversion Rate Optimization, and more. Never attended a clinic? Learn more here.